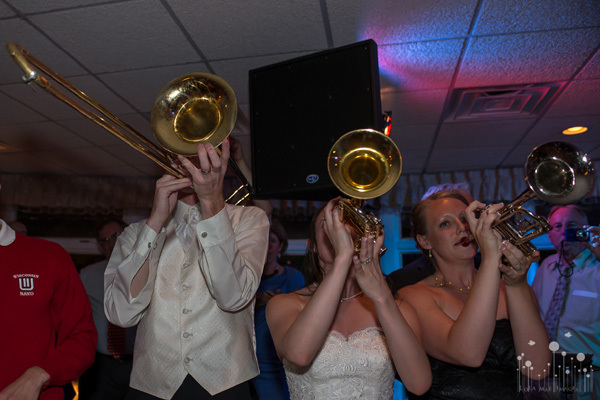 Home > Blog > For Brides > Marching Band Alumni Play at Own Wedding! Katie & Anthony, UW Madison Alumnis married at Lake Windsor Golf Course on July 27, 2013. They obtained special permission to go onto the field at Camp Randall Stadium to take photos! Kristina from Lola Mae Images shared some of her best photos of the day, including the bride and groom playing the trombone together! At Lola Mae Images, we have a laid back photojournalistic style when it comes to your photo sessions. We always shoot with 2 photographers. We capture all those treasured candid moments, as well as getting the posed shots you know grandma expects. Our goal is to capture you being exactly who you are, and we want you to enjoy your time in front of the camera. Lola Mae Images specializes in weddings, couples & family portraits, and childrens sessions. Check out more of Lola Mae Images photos on her WPUSA profile, website. Zachary, August 26, 2013 6:01 am - Marching Band Alumni Play at Own Wedding!